Marcy's condition deteriorates, requiring two new travelers to attempt an experimental procedure that could keep her alive, but at a high cost. *Marcy wakes up in bed with David. As they start to make love, she gets a nosebleed and a time-of-death appears as she collapses. *A traveler arrives in a host who was about to be killed in a farming equipment/barb wire mishap. *Trevor changes his organ-donor-wound bandage, then bikes off to hide in the backseat of Miss Day's car, he sedates her, and we see her time-of-death countdown begin. *MacLaren makes Kat coffee, but has to rush out when David calls about Marcy. *Miss Day comes to, zip-tied in forest by Trevor. He tells her all about being a traveler from the future, and that he's taken her out in the forest to be off-grid until she's safely past her original time of death so she can't be made a host. *In the hospital, Marcy tells MacLaren about the problem with her host brain. *Carly gets a call from the CPS agent, who says since she abandoned Jeffrey with his father for 2 days she's recommending he maintain custody until the next hearing. *In the hospital hallway, a messenger tells MacLaren his next mission is to greet arriving Traveler 0014 today. *Time-travel rules -- new travelers can only go back in time as far as the most recent arrival of a new traveler (no do-overs). 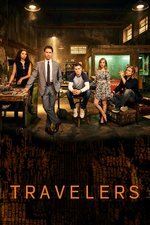 Travelers couldn't go back before the times of computers, because of needing the T.E.L.L. data (time, elevation, latitude, and longitude at time-of-death) (so no killing Hitler and Stalin). *MacLaren and Philip each go to a potential arrival location. When nobody comes near death at Philip's location, he remembers that his T.E.L.L. is the name that Trevor recognized on the sharpie wall of death ant that he must have interfered. *Trevor is about to inject Miss Day with the memory inhibitor, but she convinces him to let her walk back to the car rather than be carried. Eventually, she fakes a stumble, hits Trevor with a rock, and beats him back to the car, but as she begins to drive away she calls 911 which puts her back on the grid (GPS and voice recognition), and the new traveler consciousness overwrites her. *Carly confronts Jeff and tries to goad him into attacking her in front of a surveillance camera, but he doesn't fall for it. *After Marcy's doctor tells her they need to repeat the MRI, Marcy sends David for juice so she can tell everyone on comms to get her out of the hospital before the MRI blows her cover. MacLaren convinces Officer Boyd (who is her team's medic in addition to being team leader, since the original team leader was killed) to try to help Marcy. *MacLaren convinces David to help in sneaking Marcy out of the hospital; when the nurse comes to bring Marcy for the MRI she finds David in the bed wearing her sensors instead. *Back at Ops, Boyd gives Marcy a shot, but agrees with Marcy that there's nothing they can do to cure her unless the director authorizes intervention by the higher tech medics. *Day was team lead on social media and blames herself for the brain-damage mix-up, her plan is to repackage Marcy's original transfer to compress it and bypass the damaged parts of her brain. She may lose some of her original memories, and will lose all memories of her time in the 21st century from the first transfer. *Marcy asks to go see David before she decides whether to go through with the plan, but while they are waiting for him to arrive, her new time-of-death countdown begins, and she is overwritten, and greets him as a stranger when he does. Poor David. And poor Carly - not really liking MacLaren falling for Kat and leaving her in the lurch this way. Thank you Original Grace, for getting us a few answers about the time travel restrictions from Trevor. Poor David and poor Carly indeed. I preferred Original Grace - New Grace is really a jerk. Huh, so traveling into a host is a one-way street (locked in)... but travelers can be implanted several times? I assume they don't retain in-frame memories? Since no new implantation happened (locked in) I'm assuming that a hypothetical new traveler could be implant before Marcy's re-install. Agreed, new Grace Day (0027) is a jerk. Carly has a really awesome leather jacket, at least. But yeah, terrible host body/McLaren situation to be stuck in. Ok, I'm not a Will and Grace fan, but was Mac's line "You must be Grace?" a nod? Did they take a whole season to set that up? I guess all that woo was not quite enough to get me to see how reimplanting Marcy into a defective brain was going to help things. Won't she just burn through her neurons trying to make the underdeveloped brain work up to her needs the same as before? and hasn't she done some damage to the hardware already by doing what she had done the first time round? My guess on the re-install is that it's like having a hard drive with bad sectors. If your installation software knows where the bad sectors are and can install around them, you get something that works. This is so much better than the previous episode. And I like Mac and Kat. I think it's the King of Cardigans - the most empathic man in the world who is swinging this for me ... no it's the writing of all of it. Brings up really interesting issues - last episode should have also but missed, somehow.